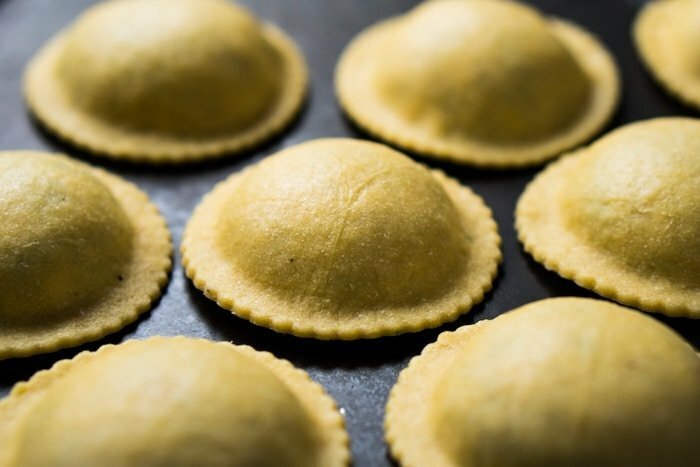 Think of these grain free and keto ravioli as pillowy-soft bites from heaven! 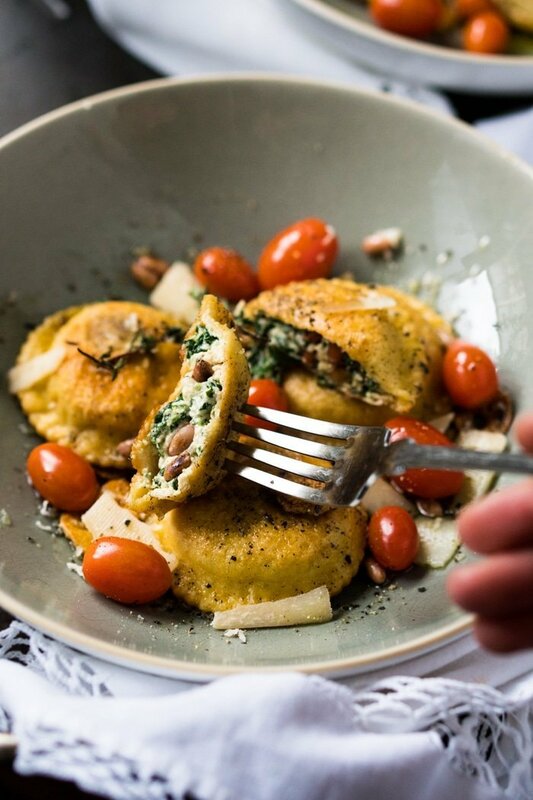 Filled with spinach, ricotta and toasted pine nuts, they’re then fried in a garlic and thyme-infused brown butter for a killer result. I looove to fill up these keto ravioli with spinach, ricotta and toasted pine nuts. Simple, yet ridiculously tasty. They’re then cooked in a garlic and thyme-infused butter; which browns as the ravioli cook, yielding a delicious dipping sauce. Fun fact: since the recipe was first published (back in January ’18), many of you have informed me that there’s such a thing as toasted ravioli up in St. Louis (and that these are not far off!). How neat is that?! p.s. These guys are super awesome for meal-prepping! 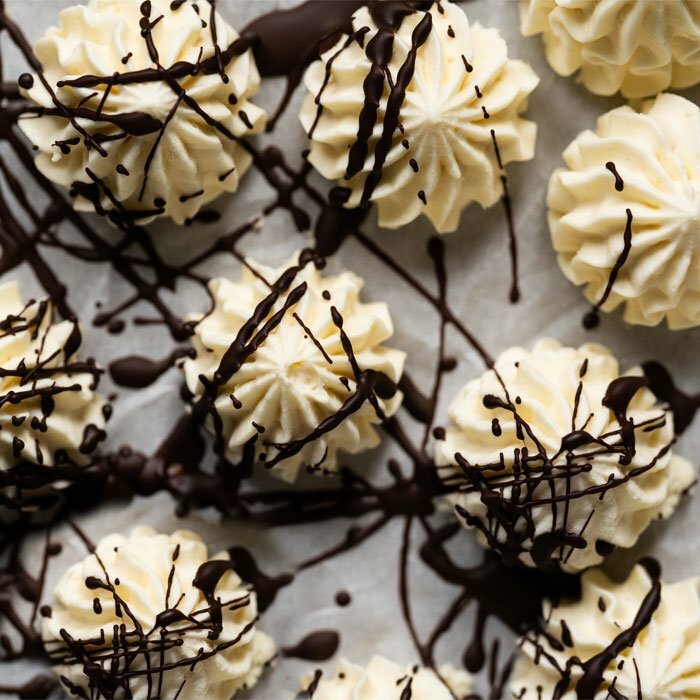 Simply whip up a large batch, freeze, and cook straight from the freezer as needed. 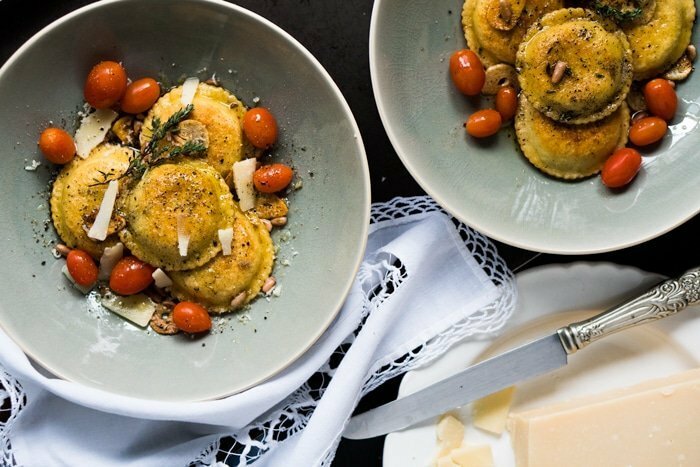 These keto ravioli are a spinoff of our grain free keto tortillas. Think almost the same ingredients: almond flour, coconut flour and a touch of xanthan gum (minus the baking powder). But slightly wetter, so you’re able to get it nice and thin (think almost translucent). Allergic to nuts? We’ve heard great things about substituting the almond flour with sunflower seed meal or pumpkin seed meal from readers. Color and taste will be different though. Otherwise, no substituting flours here and the xanthan gum is absolutely necessary. And, if possible, weigh your ingredients for consistent results. The real trick here is to get the keto pasta dough nice and thin. 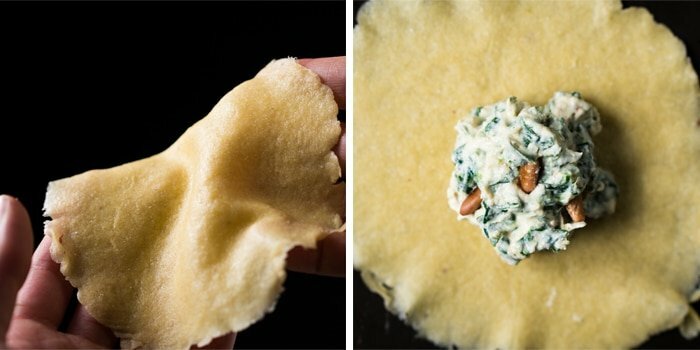 This way you’ll end up with pillowy-soft ravioli, as opposed to doughy ones. In the end, you want the filling-to-dough ratio to be much greater. This is easiest done using either a tortilla press (cast iron ones are the best) or an actual pasta machine. But a rolling pin (with some patience) will work too. The dough should end up translucent when held up against natural light. Heap roughly a tablespoon of filling onto the dough. Drape a second piece over it and press around the edges to seal, removing any air bubbles. The dough will sticky, so no egg wash is needed. We simply used a cookie cutter here, but feel free to use whatever floats your boat. Just keep in mind that you’ll want to trim the edges close to the filling. You’ll want to freeze the ravioli for 15 minutes prior to cooking. And yes, you can go ahead and freeze them too, but thaw them out slightly before cooking. You’ll also want to cook these guys always in a little olive oil or butter, never in water (they’ll just be mushy). But they’re absolutely killer fried. 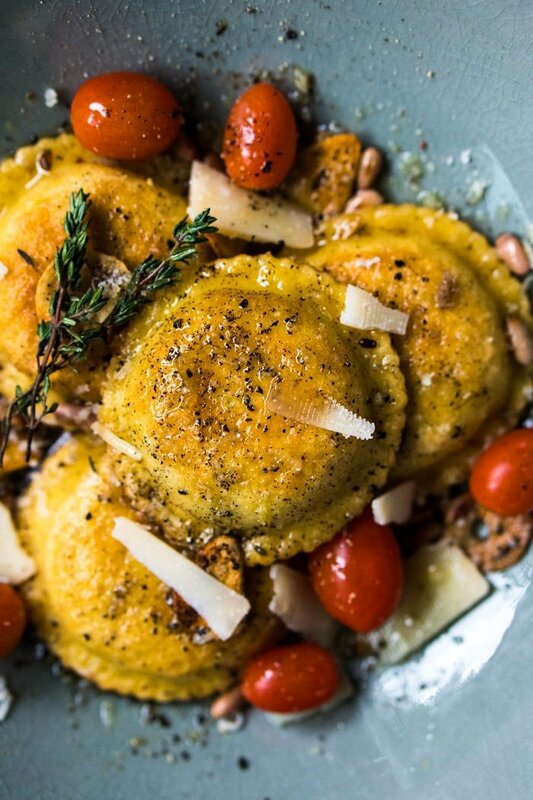 Think of these grain free and keto ravioli as pillowy-soft bites from heaven. 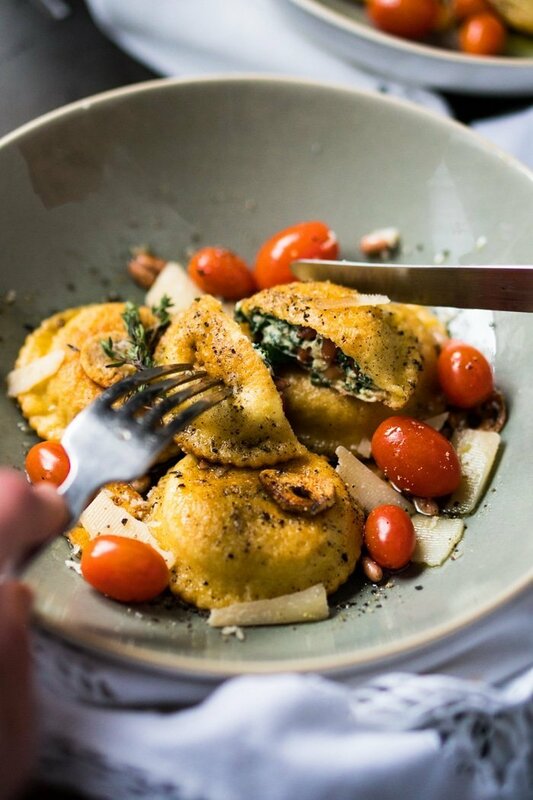 Filled with spinach, ricotta and toasted pine nuts, they're then fried in a garlic and thyme-infused brown butter for a killer result. Add almond flour, coconut flour, xanthan gum and salt to food processor. Pulse until thoroughly combined. Pour in apple cider vinegar with the food processor running. Once it has distributed evenly, pour in the egg. Add water teaspoon by teaspoon, as needed, until the dough forms into a ball. The dough should be firm, yet sticky to touch and with no creases (which mean the dough is dry and you need to add a little more water). Wrap dough in cling film and knead it through the plastic for a couple minutes. Think of it a bit like a stress ball. Allow dough to rest for 15 minutes at room temperature and place in the fridge for 45 minutes (and up to five days). Heat up olive oil in a skillet or pan over medium heat. Add garlic and sauté briefly until golden. Add spinach and turn down the heat. Once wilted, squeeze out excess liquid, transfer it to a board and roughly chop it. Allow to cool. Mix spinach with ricotta, grated Parmesan cheese, toasted pine nuts and freshly grated nutmeg. Season to taste with salt and freshly ground pepper to taste. Mix in egg yolk. 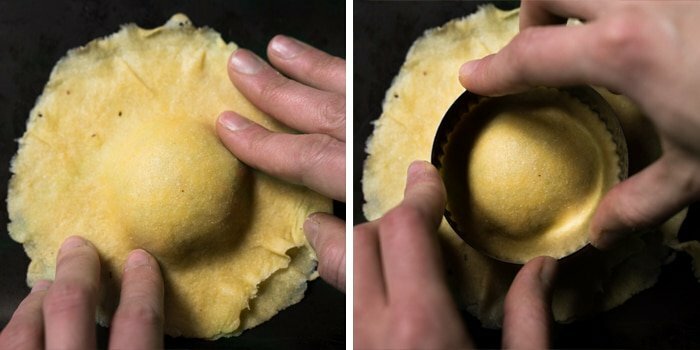 Roll out the pasta to its thinnest point using a pasta machine or a tortilla press (between parchment paper). You can also use a rolling pin, but it'll take a little longer. The dough should end up translucent when held up against natural light. Heap roughly a tablespoon of filling onto the dough (see pictures in post). Drape a second piece over it and press down around the edges to seal, removing any air bubbles. The dough will sticky, so no egg wash is needed. Trim the edges close to the filling using a cookie cutter (or pizza cutter/knife/glass). Place all the ravioli on a baking tray and freeze for 15 minutes prior to cooking. Heat up butter and oil in a skillet or pan over low heat. Once warm, add in garlic slivers and thyme. When the garlic begins to brown, add in chilled ravioli. Cook ravioli in the butter until golden all over, a minute or two on each side. If the garlic slivers begin to brown too much, you'll want to pull them out (do not discard). Serve right away over a bed of cherry tomatoes and topped with slivered parmesan and the crispy garlic slivers (opt out if garlic isn't your thing). Feel free to go ahead and freeze the ravioli, but you’ll want to thaw them out slightly before cooking. 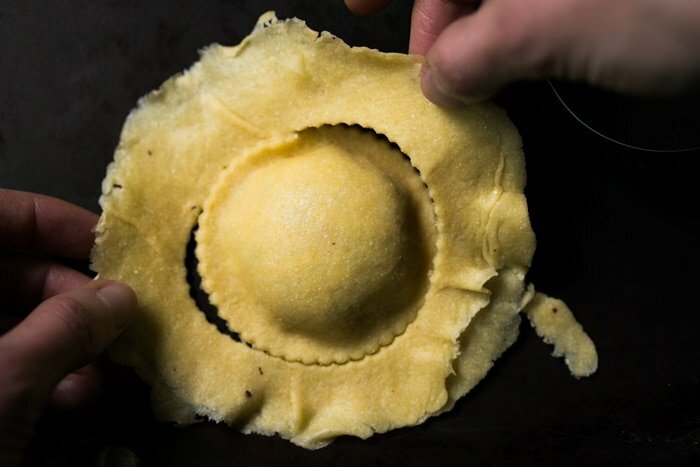 This recipe yields 20 x 2 1/2 inch ravioli. Nutrition facts below were estimated per ravioli with the filling, so a serving of four pieces is 6g net carbs. Do you think I can hand mix this? I currently am away from my home, and do not have food processor…could it work? I have a vita mix but I’ve never done a dough in it…and can’t imagine it working…your thoughts please! 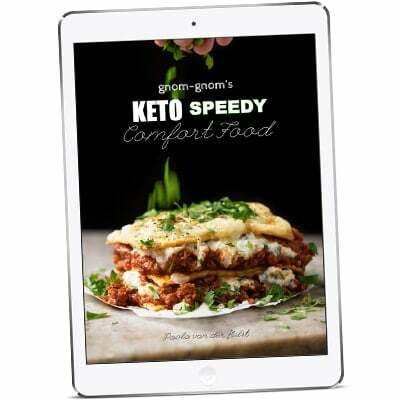 Love the site for sure … I bought the ebook, but do you have hard copy cookbook also? I like books, cookbooks to be exact!! Stuck in house with up to -50 wind chill so going to give this a try! Any word of advice for newbies? These worked out great. Have you tried just freezing the dough by itself and using it later? I’ve loved the recipies and had fun. Wife from Guatemala so your take on some dishes has been very much appriciated. I have no clue what I’m doing wrong with the dough. It cracks apart when I try to run it thourgh pasta machine. After going through seveal batches, I rolled it out. While worked well enough, I’d love to get it thin as I can only imainge how much better it would be. Have you actually had success running this through a pasta roller? if so, any tips to keep this dough together as you run it through a machine? I made these raviolis with the 3-cheese filling and they were a big hit! Even my picky husband liked them. I made BIG ravioli so I only got 10 and there are leftovers for tomorrow. They are very filling. I attempted to put the dough through my pasta roller but it kept breaking apart, even on the highest setting, so I resorted to the rolling pin; labor intensive but successful. After frying, I added a mama-jama-sized meatball and marinara to finish the dish. 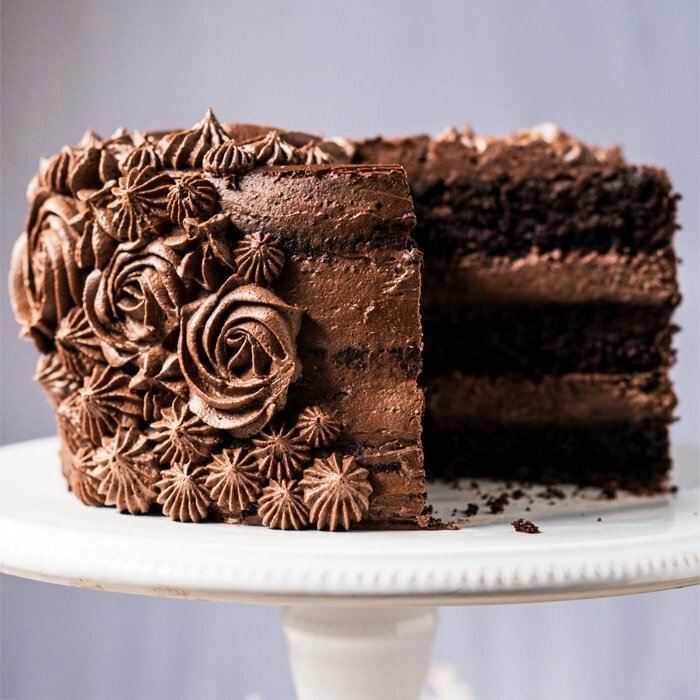 REALLY LOVE THIS RECIPES!, ESPECIALLY THIS ONE!. Had 4 pieces with some lemon and thyme chicken on the side. Didn't have a pasta maker and although I rolled as thin as I could, didn't quite make it to 20. One thing to note, When I entered the ingredients into MFP, each ravioli came to 208 cals, not 88. Anyway, looking forward to my next meal of them, without all the prep. 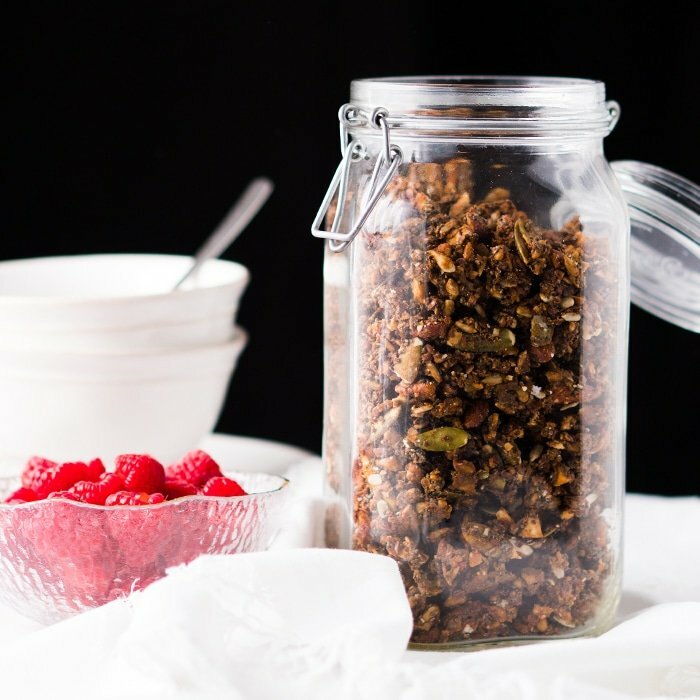 I am SO incredibly excited to have found this recipe, and your blog! Picked up some chicken of the woods mushrooms from the farmer’s market this weekend and will be making my own mushroom-y twist on this keto ravioli tomorrow night. CANNOT wait to try! Thank you for sharing! Hi Michele! 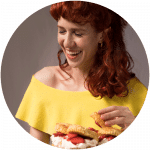 It just sounds like your batter was a bit too wet (different size eggs and absorbency, particularly of the coconut flour, can vary a lot form brand to brand). I would say to just add less water next time, the dough will be sticky but sturdy xo! Thank you, I will try again. On a side note…can I pre-grind my psyllium husk and golden flax meal and store so it’s ready to use? I wasn’t sure if it would ruin it if it wasn’t used for a couple of weeks. Yeah def I do that to save a bunch of time! If you don’t use them that often I would suggest keeping them in the freezer (flaxseed is notorious for going bad quickly) xo! Do you know another substitute for the coconut flower? I am highly allergic to coconut. This looks so good. Even though I couldn’t get the dough to work with me, I rolled it out and made a log and baked it in the oven. It was so good. This keto diet is for my husband but for dinner we support him by eating keto. This is a recipe that I could make without the family realizing they’re eating healthy. I can’t wait to try your other recipes. Hi Paola! I have been cooking your recipes and loved every one of them! Do you have a recipe for a keto spanakopita? 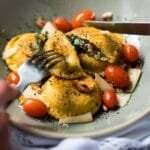 I’m craving those right now, maybe the ravioli will help me with that!